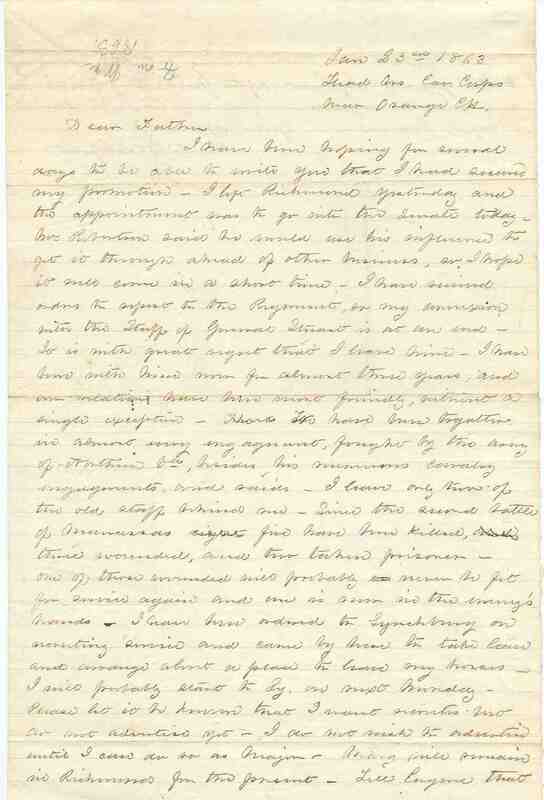 Item description: Letter, 23 January 1863, from William W. Blackford, near Orange Court House, Va., to William M. Blackford, expressing his regrets at leaving Gen. Jeb Stuart’s staff. Item citation: From folder 84 in the Blackford Family Papers #1912, Southern Historical Collection, The Wilson Library, University of North Carolina at Chapel Hill. I have been hoping for several days to be able to write you that I had received my promotion. I left Richmond yesterday and the appointment was to go into the Senate today. Wm. Robertson said he would use his influence to get it through ahead of other business, so I hope it will come in a short time. I have received orders to report to the Regiment, so my commission into the staff of General Stuart is at an end. It is with great regret that I leave him. I have been with him now for almost three years, and our relations have been most friendly, without a single exception – have been together in almost every engagement, fought by the army of Northern Va., besides his numerous cavalry engagements, and raids. I leave only two of the old staff behind me. Since the second battle of Manassas five have been killed, three wounded, and two taken prisoner. One of those wounded will probably never be fit for service again and one is now in the enemy’s hands. I have been ordered to Lynchburg on recruiting service and came by here to take leave and arrange about a place to have my horses. I will probably start to Ly. on next Monday. Please let it be known that I want recruits but do not advertise yet. I do not wish to advertise until I can do so as Major. Mary will remain in Richmond for the present. Tell Eugene that I met Gen. & Mrs. Rodes riding out this evening & the General inquired after him [very?] particularly and sent his regards. Give my love to Mother, Mary & Eugene. 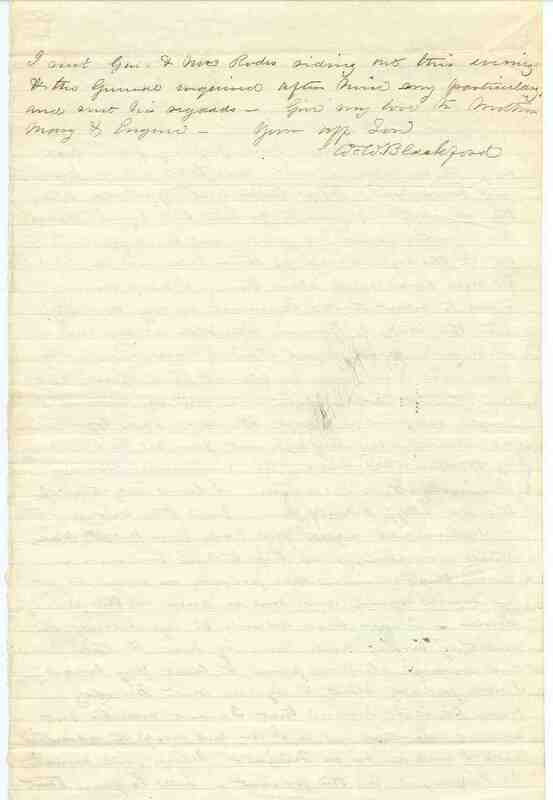 This entry was posted in Southern Historical Collection and tagged Blackford Family, cavalry, Jeb Stuart, military commission, Virginia, William W. Blackford. Bookmark the permalink.